Double-click for a full-screen version. So what’s on that map? 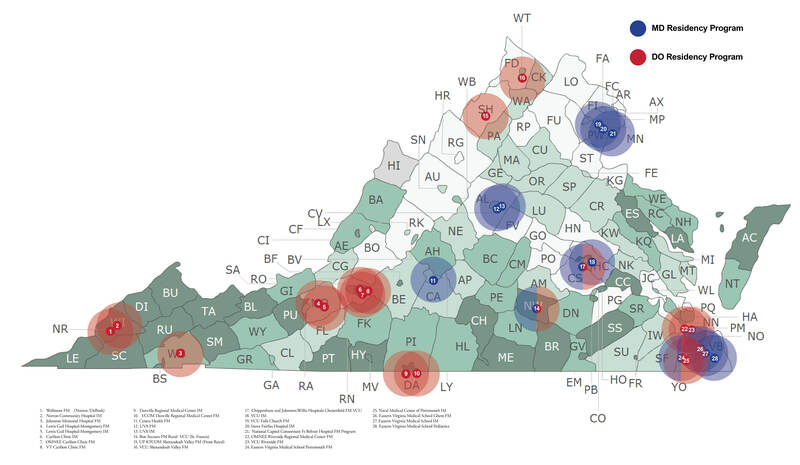 These are the Family Medicine, Internal Medicine and Pediatric residencies in Virginia (blue = MD, red = DO). The counties are color coded by their County Health Status ranking. Very light colors are the best rankings, dark green – the opposite. Do you have comments on the implications of this map? Do you know of other residency programs that should be included? Let us know! For twenty years, the Virginia Rural Health Association has served as “The Voice for Rural Health in Virginia.” Now we are asking you to help us turn up the volume on that voice! Rural hospitals, clinics, providers and students are under greater pressure than ever to provide services in an increasingly challenging environment. For our 20th Anniversary, we are asking all rural health stakeholders to raise their voice with us and help call attention to the needs of Virginia’s rural citizens. 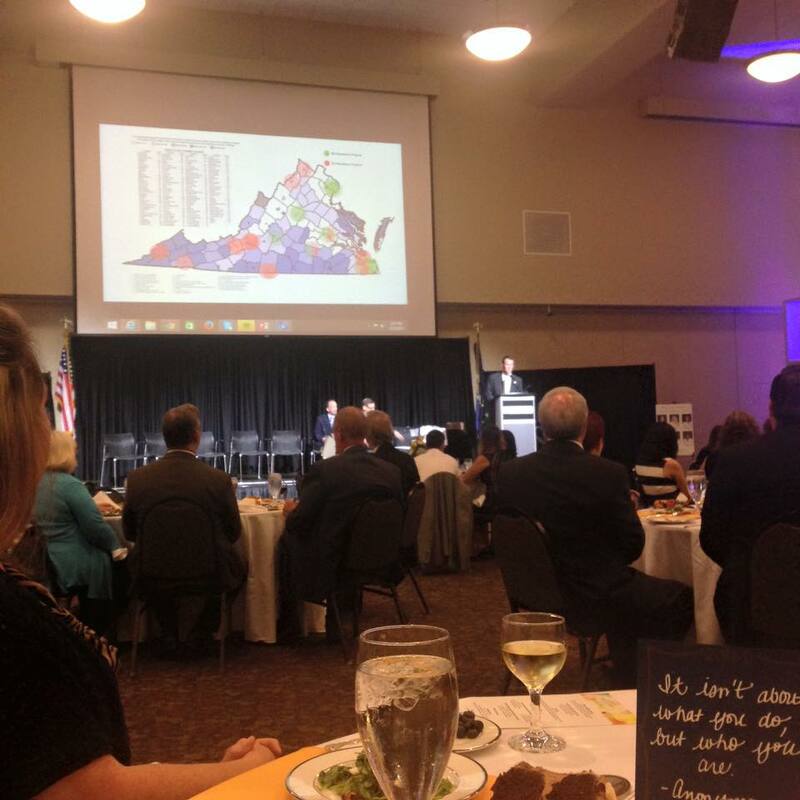 The Annual Conference of the Virginia Rural Health Association is an opportunity for the people and organizations that serve Virginia’s rural population from across the Commonwealth to meet. The event is filled with workshops, keynote speakers, networking and an Exhibit Hall. The people who attend the event are as diverse as the VRHA membership: hospital executives, academic faculty, clinic staff, government officials, health professions students and more. Join us! Visit the conference website for details. 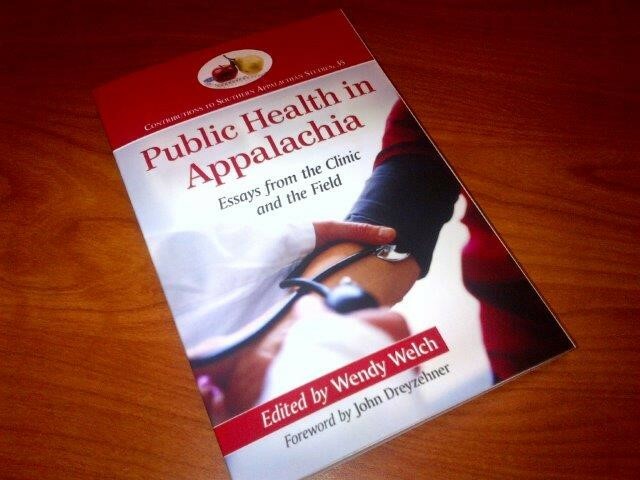 Introducing GMEC’s new book PUBLIC HEALTH IN APPALACHIA which contains “Essays from the Clinic and the Field”. From the back cover: The Appalachian region of the United States sees hunger, poverty, disability, preventable illness and premature death in disproportionately high numbers. Yet, Appalachia also knows the quiet strength of people working together to life one another up as a community. In this collection of essays, health professionals explore how clinics and communities address the barriers to healthcare that continue to plague this underserved region and discuss theoretical perspectives about Appalachian healthcare. Topics include regional dental care, cancer and diabetes treatment, the integration of primary care and behavioral health, telehealth, the importance of “patient responsibility” and the effects of faith, fatalism and family dynamics on the health of Appalachian youth. Avoiding simplification and stereotype while presenting data, analysis and anecdotes, this volume gives a detailed picture of Appalachia’s complex and multi-faceted public health challenges. BETH O’CONNOR THE EXECUTIVE DIRECTOR OF THE VIRGINIA RURAL HEALTH ASSOCIATION HAS SOME THOUGHTS ON MEDICAID REFORM THAT WERE PUBLISHED IN THE ROANOKE TIMES. Introducing the BLUE BOOK of Health Care Terms. A joint project of GMEC and the Virginia Rural Health Association http://www.vrha.org, this book contains abbreviations and explanations for common medical terms and agencies in Virginia. Created as an aid for legislators regarding healthcare terms, the book has proved popular with hospital boards, agency executives, and non-profit organizations across the State. To order copies ($15 each) contact Beth O’Connor, Executive Director of VRHA, at boconnor@vcom.vt.edu. A limited number of review copies are available.